I first heard about the furries in 2009. I was browsing YouTube and found videos of people in things called fur suitsrunning around and having all kinds of fun. 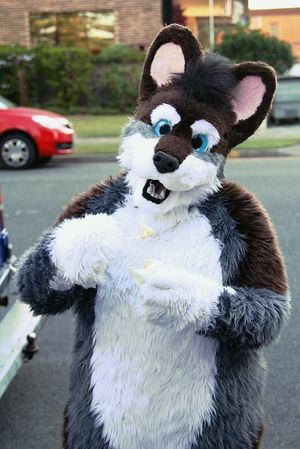 By mid-2010 I had decided on my character, made myself a fur suit and was off to my first furry meet. Since then the furry fandom has been a huge part of my life. Kelly dressed up as "Tyler". Meets can be as simple as a group of friends meeting in a park for a barbecue and a chat and as big as conventions with hundreds of attendees spanning entire weekends full off laser tag, talent shows, video game tournaments, fur suit games and dances. It's all about getting together, socialising and having fun with your friends like any other social group. 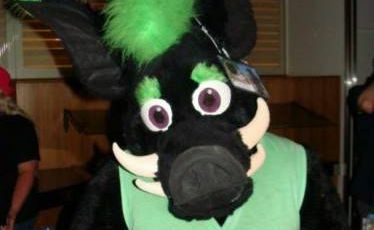 My character is a black and neon green warthog by the name of Toska. I chose a warthog to be different and since creating Toska in 2009 I haven't come across another warthog. As an outsider yes actually, but having seen the madness that goes on behind the scenes over the last couple of weeks there is a lot of work that goes on to ensure the success of the meets. As I mentioned above the furry fandom is a huge part of my life, that's because I make fur suits for a living. I have been making fursuits for three years now but officially started my business The Menagerie Costumes (TMC) in 2012. Imagine being wrapped up head to toe in your warmest blanket. Now imagine while in your blanket you can only see directly in front of you, no perioral vision and you can't see below your nose. Now imagine you are also looking through thick flyscreen… that is what it is like to wear a fur suit. It's hot and sweaty, you can't see very well, your hearing is muffled by layers of foam and fur, and your hands are trapped in bulky gloves, it is also the most fun a person can have! Jump on in! Find a local meet and go make some friends, I did it three years ago and haven't looked back since. 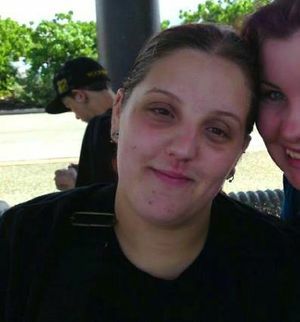 Kelly Hampson minus her fur suit. I personally have furry friends ranging from early teens to their 50s. The furry fandom started in the 1980s as an offshoot from the science fiction fandom, since then it has grown into a worldwide subculture. There are a few unusual suits out there that I really like, in particular a coati, honey badger and a spider. I personally think everyone should jump in a fur suit but I would love to see Jack Black suit as a panda or maybe a tiger (refrains from going on a long winded Tenacious D based explanation).